I'm crazy about EMMANUEL'S DREAM: THE TRUE STORY OF EMMANUEL OFOSU YEBOAH, a picture book written by Laurie Ann Thompson and illustrated by Sean Qualls. Here is the inspiring true story of Emmanuel Ofosu Yeboah, who cycled an incredible four hundred miles across Ghana--with only one strong leg--to spread his powerful message: disability does not mean inability. Yes! What an important message! Also, what an incredible book! As anyone who's tried to write a picture book can attest, picture books, which seem so simple, are difficult to write. To be able to tell a complete story using so few words is a huge accomplishment. Add to that the required research for a well-told biography and the ability to boil it all down to a meaningful story, using language that's accessible to young readers--wow! Yet Laurie manages it skillfully. Every word feels right. Laurie pulls readers in, describing when baby Emmanuel was born. And that's just the first page! 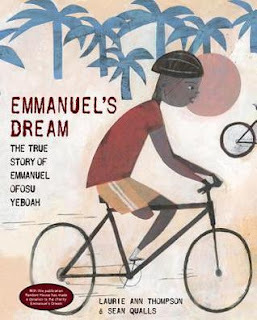 EMMANUEL'S DREAM is gorgeous, and the story is inspiring without feeling didactic.The whole book is packed with heart because of the true story of Emmanuel, Laurie's excellent words, and Sean Qualls's art. The illustrations are strikingly beautiful with light backgrounds and bold colors, and they convey so much emotion. There's story in the illustrations, and I love the illustrator's images, colors, and flavor. EMMANUEL'S DREAM was the winner of the ALA Youth Media Awards Schneider Family Children's Book Award in 2016, and it was a Junior Library Guild selection. This page on Laurie's website shows an impressive list of the book's awards, honors, and reviews. 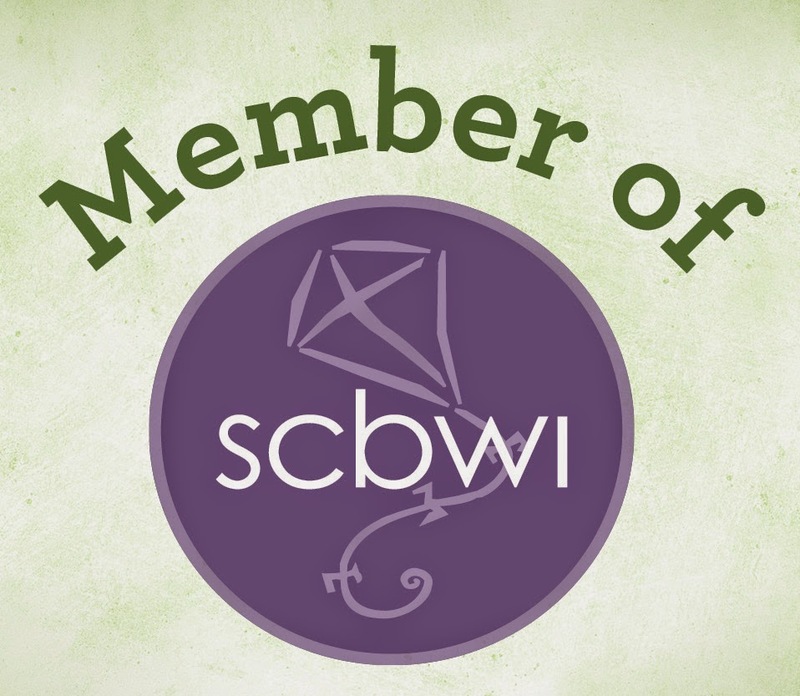 Laurie is the Nonfiction Coordinator and CoPAL (Published and Listed) Liaison for SCBWI Western Washington. I've known her for years through SCBWI, and she's super nice. Check out her website here. I've just discovered Sean Qualls, and I love his artwork! These are links to his blog and website. Here is a link to a great interview with him from 2008. He talks about his background and his process. Yesterday, bookseller Victoria Irwin and I were admiring my copy of EMMANUEL'S DREAM at Eagle Harbor Book Company, and we posed for a picture. How about you? Do you write fiction, nonfiction, or both? What's your favorite nonfiction book for children or teens?